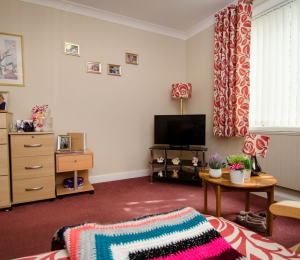 Comfort House Care Home is situated in a housing estate in Newcastle. It is close to shops and services and has good public transport links. We are part of a wider, friendly and welcoming community – as you’d expect in the north east! – and here at Comfort House we make sure that all our visitors are made welcome and well looked after, whoever they are. This is a residential Care Home, and most of our residents are mentally alert, with a good sense of humour, which means that there’s a relaxed and pleasant atmosphere here, with plenty of good-humoured banter. It’s also a very comfortable Home. The bedrooms are large, all ensuite with showers, and there are good communal areas. We have a dedicated and compassionate team here. It’s a stable staff group, with a low turnover, which means that staff can build close and meaningful relationships with the residents. We encourage residents to stay alert and get involved in activities. Entertainers come to the Home, we have arts and crafts sessions and film shows. We have a hairdresser, we have drinks evenings – never a dull moment! We’re also involved with the Hen Power project, so we have three chickens in our garden, which the residents really enjoy looking after. In fact, some of the ladies asked for a room overlooking the garden so they could look at the chickens out of their windows. The Hen Power project also gives us access to a range of artists and acts, so that will give us an opportunity to offer even more activities to the residents. Many of our residents have lived all their lives in this part of the city, so we have lots of informal links with the wider community through families and friends. Our residents still go to local shops or the pub, which helps to bring continuity to their lives - a sense that they still belong to a wider community.